Does your gutter or downspout need to be repaired or replaced? Don't wait until it's too late! Call our gutter experts at Town & Country Seamless Gutters now. With nearly 20 years of experience, we can offer you peace of mind that your gutters will be in perfect working order again! We provide guaranteed workmanship. 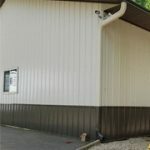 When you need gutters for your home or office, we are the perfect company for you. From custom fabricated gutters to downspout installations, we can take your ideas and bring them to life. We only use high-quality aluminum gutters for your home or business. We even offer heated gutters and Teflon® coated gutters from DuPont™ to withstand the elements and time. Get an extended warranty on items with an existing manufacturer's warranty.